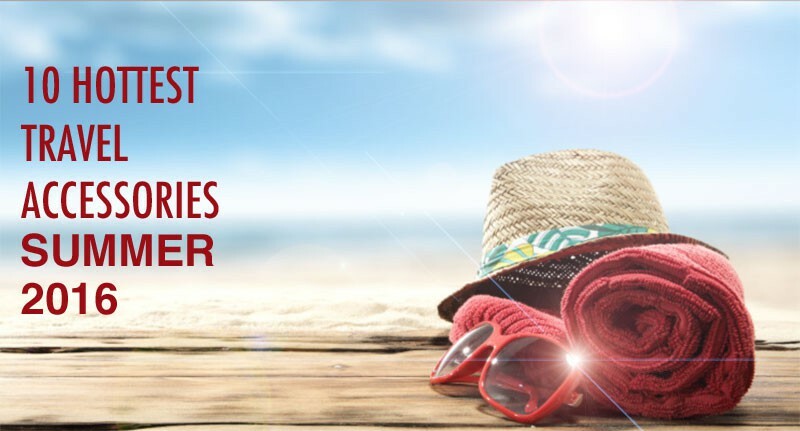 Summer is in full swing and now’s the time to take advantage of long, warm, sunny days. 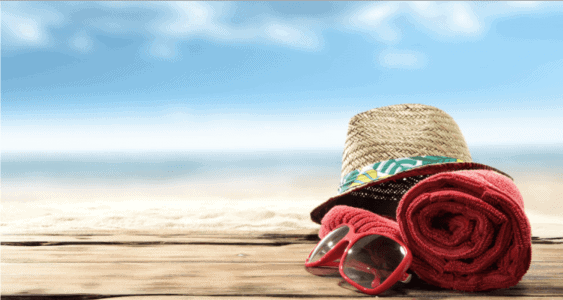 Whether your summer travel plans include lounging by the pool, basking in warm beach waves, or island hopping on a luxurious yacht, these travel accessories are the hottest, must-have items you’ll need this summer. Every traveler needs the perfect luggage and nothing is more convenient or stylish than the Prada Trolley. The Prada Trolley has two wheels and a telescopic handle for ease of navigating through busy airports. 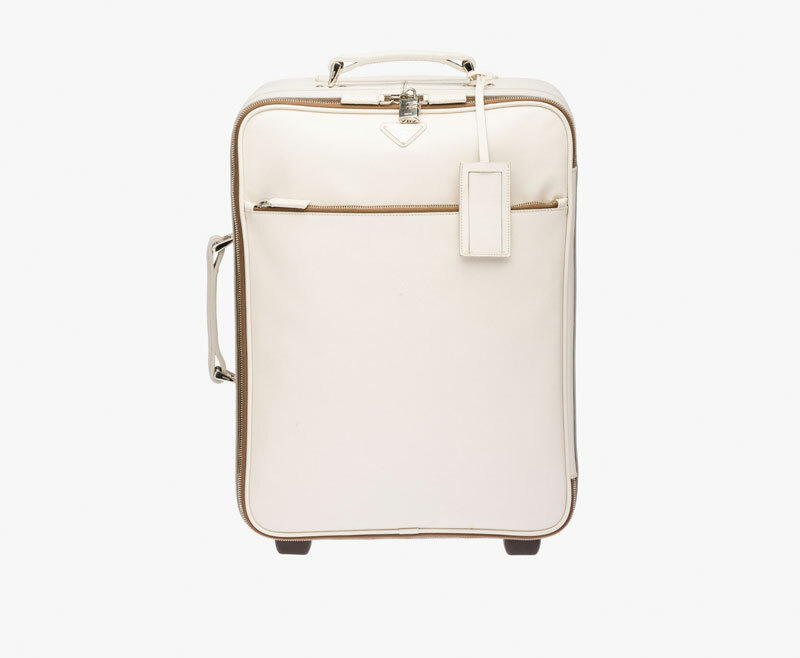 Approved carry-on size, you’ll be able to take all of your essentials with you and avoid the hassle of baggage claim. The Prada trolley is made of luxurious Saffiano leather and is available in chalk white, baltic blue, burgundy, and black. If you’re looking for something more compact and equally stylish, Prada also makes a beautiful squared backpack that can double as both a carry-on and for carrying daily essentials as you explore exotic places abroad. Prada’s backpack is made of soft calf leather with a fabric lining and three inside pockets; and of course, everyone will know it’s a Prada thanks to the beautiful enamel triangle logo on the right side of the backpack. Keep your passport, boarding pass, foreign currency, and metro tickets organized with the Smythson Panama Marshall Travel Wallet. This travel wallet has three document dividers, beautifully labeled with gold stamping and includes a boarding pass pocket for ease of hopping from airplane to airplane. Available in a variety of colors, including pink, green, black, red, navy, and light blue, the Smythson Panama Marshal Travel Wallet is perfect for any jetsetter. You’ll be able to capture all of the best memories from your summer travels, even in the water, with the Nikon Coolpix AW120 waterproof digital camera. The Nikon Coolpix is waterproof up to 18 meters deep, freezeproof up to 14º F, and can withstand a drop of two meters. If that’s not enough, the Coolpix has other waterproof digital cameras beat with its high performance NIKKOR lens, built in Wi-Fi, and can take full HD videos. Whether your summer travels lead to you partying on the beach, sailing the coast, or roughing it in the great outdoors, you’ll need to keep your drinks chilled, the margaritas flowing, and the beats playing. With the Coolest Cooler, you’ll be able to do all that and more! Not just a cooler, the Coolest Cooler is basically the Swiss Army Knife of coolers. Equipped with a built-in, rechargeable blender, detachable blue tooth speaker, USB charger, 4 BPA-free plates, a knife, a corkscrew, and a bottle opener, the Coolest Cooler will have you prepared for any summer party adventure. It’s also so well insulated, ice can last four to five days. Make the most of your summer days lazing in a pool with the Monster 24K™ Superstar Backfloat waterproof speaker. Not just for the pool, the Backfloat brings your favorite music anywhere and everywhere. Boasting all of the perks of the classic Backfloat, like powerful wireless sound and waterproof floating design, the 24K™ Superstar Backfloat has the added style and bling of 24K gold. No matter where you’re summer travels take you, you’ll need a stylish pair of sunglasses and Ray-Ban is the epitome of timeless, classic style. You can’t go wrong with a pair of Wayfarers (they’ve been a must-have accessory since Ray-Ban introduced them in the 1950s) or a pair of lightweight, breezy aviators. For a modern twist on the classic aviator, try a pair of bold, vibrant Aviator Flash Lenses. These gold framed aviators with lenses in vivid colors like orange, violet, green, blue, and cyclamen (a beautiful mix of orange and pink, reminiscent of a sunset over Nantucket) will make you look summer ready. Stay connected at the beach or while relaxing in a pool with the Pebble Time Steel water resistant smartwatch. The Pebble Time Steel smartwatch provides up to 10 days of battery life on one charge, includes a health tracker to count steps, monitor sleep, and help you stay fit even when on vacation. Water resistant up to 30 meters, you can take a dip or go snorkeling without worrying about missing a notification or losing track of time. The Pebble Time Steel smartwatch is available in classic gray, black, or burgundy leather bands, and sophisticated silver or gold links. One of this summer’s hottest trends is vintage inspired straw, raffia, and wicker handbags and totes. And it’s no surprise, these classic bags perfectly represent the carefree breeze of summer days. Large straw totes, like the Naomi Large Woven Straw Tote by Michael Kors, are perfect for traveling as they’re both stylish and large enough to carry essentials wherever you go, whether that be a swimsuit, book, or bottle of wine. Straw isn’t just for tote bags! Straw Panama hats are a perfect summer accessory as they look great on both men and women. Style a Panama hat with a pair of Wayfarers and you’ll be at the top of summer chic. J. 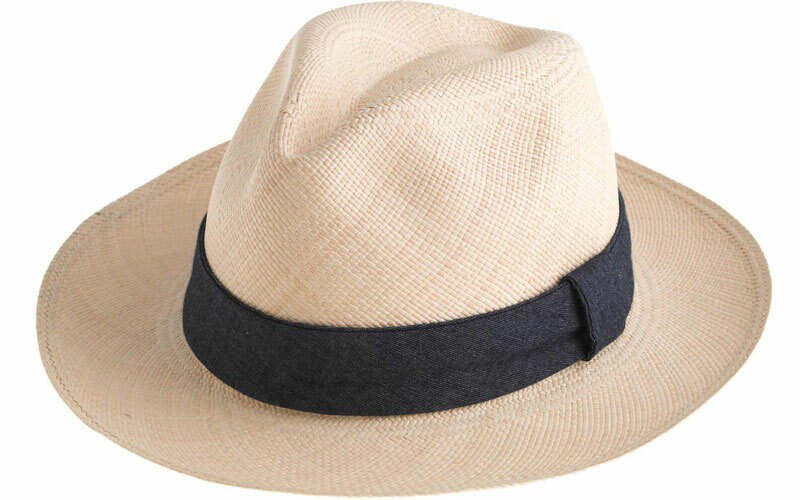 Crew offers the Paulmann Panama hat, handmade by Paulmann Hats & Accessories, in natural toquilla straw and accented with a classic indigo band. Never get stranded with a dead iPhone with the wearable iPhone charger, the QBracelet. The QBracelet can charge an iPhone to 50% in as little as 40 minutes so you’ll be able to stay charged on the go. Available in polished silver, matte silver, polished gold, and matte black, the QBracelet looks sophisticated and makes a great addition to any wardrobe. Summer will be gone before you know it so don’t wait any longer! Get the most out of your summer with these must-have travel accessories. Jennifer Thayer is a freelance writer from Southern California. She is passionate about travel, technology and exploring new adventures. Follow her on Twitter.